This is not a real manufacturer mark, it merely represents a distributor (trade)mark. 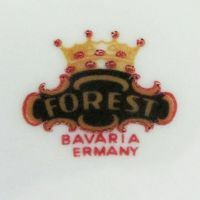 It is commonly found on items originating from various manufacturers, for example Jaeger & Co. (Marktredwitz, Bavaria) or Retsch & Co. (Wunsiedel, Bavaria). The so far identified original marks cover the date range between 1955 and 1978. 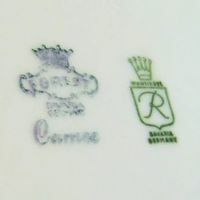 Transparent stand-alone 'Forest China' mark (above the series name 'CAMEO') next to that of an original manufacturer, Retsch & Co. (Wunsiedel, Bavaria). Example of the Forest China ⇒cover-up mark version.